BackpackIt is a quick and easy pattern for a fun and practical backpack. 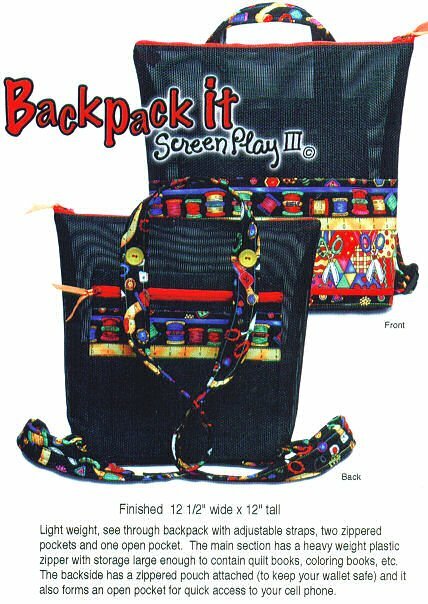 Like Screen Play and Zip It, the models shown on the pattern cover are made from black "Pet Screen" available at hardware stores. This light weight, see through backpack features adjustable straps, two zippered pockets and one open pocket. The main section has a heavy weight plastic zipper with storage large enough to contain quilt books, coloring books, etc. The backside has a zippered pouch attached (to keep your wallet safe) and it also forms an open pocket for quick access to your cell phone.